Anaiis Cisco uses film to tell the stories of marginalized people in America, and she just received the CSU Trustees' Award for Outstanding Achievement. 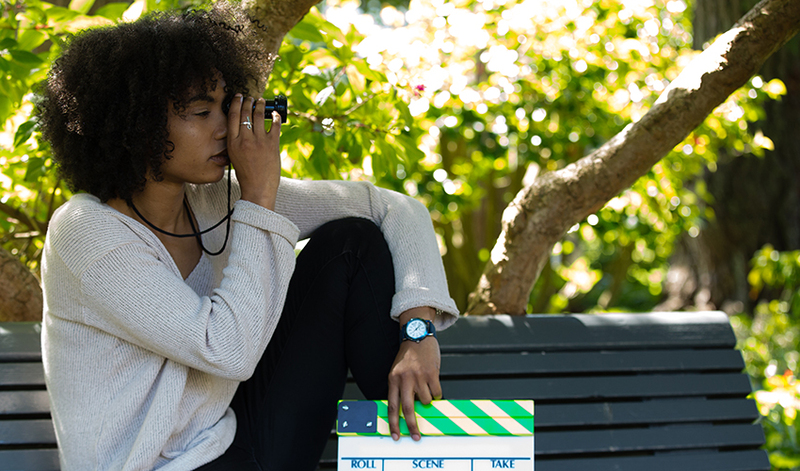 San Francisco State University MFA student Anaiis Cisco said she remembers feeling isolated in her undergraduate film studies courses back in New York City, her hometown. There were no black filmmakers and very few black actors in the early films they studied, she said. What motivates her now is increasing the visibility of minorities on screen, and she plans to write and direct films about racial, ethnic and queer minorities in America. SF State President Les Wong and Anaiis Cisco pose together at the CSU Trustees' Award ceremony at the Office of the Chancellor in Long Beach, Calif.
Cisco’s powerful work and commitment to inclusion played a part in her receiving the $6,000 California State University (CSU) Trustee Award for Outstanding Achievement. She's the first student in the creative arts at SF State to receive the award. There are 23 awardees in total, one for each campus, and it’s the CSU’s highest recognition of student achievement. The awards provide donor-funded scholarships to students who demonstrate superior academic performance, personal accomplishments, community service and financial need. Students receiving the awards have all demonstrated inspirational resolve along the path to college success. “Breathless” is currently making the film festival circuit, and Cisco has partnered with organizations to screen it in minority communities, something she said she plans to continue doing in New York and the Bay Area. In the future, she plans to earn a doctorate in film studies, but right now she’s on to her next project – a gender-fluid lesbian slave narrative.